Eve Online saw its biggest ever battle take place last week, with players taking down one of the game's largest structures in the process. 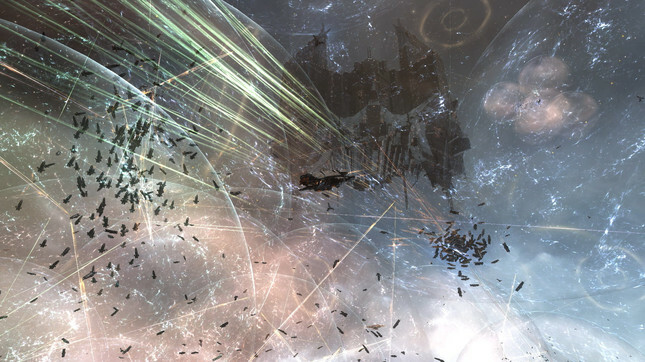 The latest skirmish in the "world war" that has been ongoing for months, the Siege of M-OEE8 saw over 5,700 players destroy a Keepstar, a type of defensive citadel introduced to the game earlier this year. The Keepstar in question - 160 kilometres tall, worth billions in in-game currency, and equipped with a capital ship-killing superweapon - was owned by the in-game faction Circle of Two, and taken down by the mercenary group Pandemic Legion in a mostly uncontested battle. Circle of Two fleet commander "progodlegend" told Polygon that despite the Keepstar's enormous in-game value, "the material cost is negligible, since both sides well outspent the cost of the Keepstar in the execution of this war." Indeed, Circle of Two "were expecting to lose the structure," according to Pandemic Legion's "Killah Bee," who expressed disappointment that "they just never entered the system over the weekend to fight." Eve developer CCP Games confirmed that the battle was the largest in the online space sim's history. CCP recently moved to support free-to-play accounts, which has injected new life into the 13-year-old game. "New players are finding their way to all of this action," said executive producer Andie Nordgren, "because there is nothing stopping them from getting into whichever part of the universe they want."